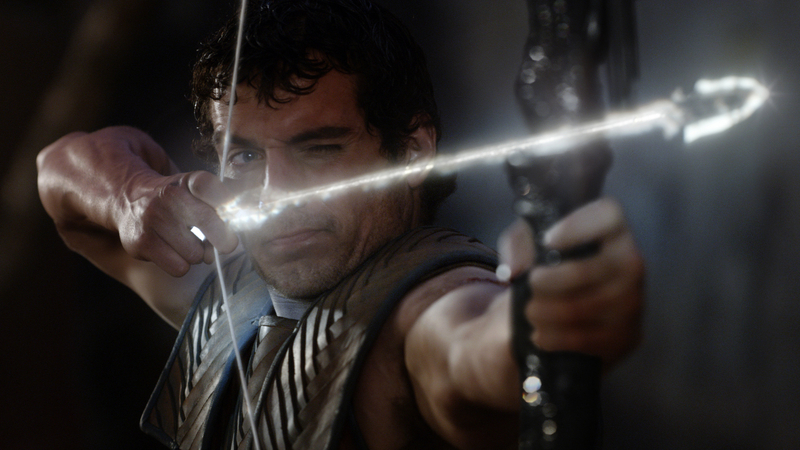 Henry Cavill stars Theseus in “Immortals,” an action film directed by Tarsem Singh. This week’s home video releases are anchored by an Adam Sandler comedy, a remake of a 1980s favorite and an action film set in ancient Greece. With “The Cell” and “The Fall,” Indian director Tarsem Singh made it clear that he values style above all, so it should come as no surprise that his take on Greek mythology is big, bold and visually impressive. Sadly, it is also dull. The movie centers on Theseus (Henry Cavill), a peasant thirsty for revenge after troops of the evil King Hyperion (Mickey Rourke) slaughter his mother. Little does Theseus know, he has been chosen by Zeus (Luke Evans) to save the entire human race from Hyperion’s devilish ways. The powerful king’s ultimate goal is to release the Titans, supernatural warriors with enough power to kill gods and end humanity. Singh follows Theseus as he comes to terms with his destiny, something that requires a string of bloody, slow-motion action sequences. “Immortals” has its own visual style, but it recalls “300” and the “Spartacus” TV series because it paints pictures of the ancient past using splashy, modern camera techniques and special effects. Alas, all this visual panache is delivered in lieu of quality storytelling. Cavill is heavily muscled and he looks great swinging a sword, but he does little to make the audience empathize with his character, and that makes it a yawn when he’s in peril. Likewise, Rourke’s Hyperion is nothing more than a caricature of evil. The script makes it obvious that he’s bad, but his motivations are never fully explored. Even the Greek gods are boring. Zeus explains that humans must find their way without help from the gods, but the reasons behind his convictions are muddy. The first few minutes of “Immortals” raises dizzying expectations, but the film grows increasingly frustrating as it becomes obvious that the script was used as a framework for pretty pictures and nothing more. DVD and Blu-ray extras include deleted scenes and a making-of featurette. Adam Sandler is such a pleasant screen presence that it’s easy to approach his films with optimism. But for every gem like “The Wedding Singer,” Sandler delivers at least two stinkers. “Jack & Jill” sits easily in the latter category, with Sandler appearing more concerned about showing off than making a consistently funny movie. The conceit of “Jack & Jill” is that he plays two characters – twin brother and sister Jack and Jill Sadelstein. This allows Sandler to stuff his already over-the-top comedic style into a dress, and that alone is supposed to make us laugh. The plot is simplistic. Jack is a businesslike advertising guru living in Los Angeles with his wife, Erin (Katie Holmes), and their two children. Jill is an obnoxious free spirit who resembles Jack in appearance only. Because Jack is nothing like his twin – and because she is ridiculously grating – their reunions are nightmarish. That, in a nutshell, is the film. Sandler alternates between pants and dresses, doing little to disguise the fact that he’s playing both roles, and director Dennis Dugan allows the story to play out in slow, grinding fashion. None of this is Dugan’s fault, mind you. The veteran director was saddled with a horrid script written by Sandler in conjunction with Steve Koren and Ben Zook. Although the film makes attempts at numerous gags, few of them land, leaving the audience with a movie that feels considerably longer than it is. Oddly enough, the funniest moments involve one of cinema’s great dramatic actors. Al Pacino plays a fictionalized version of himself, and the result is amusing. Still, Pacino is too good for a movie like this. Truth told, Sandler is too. But for some reason he won’t stop making them. DVD and Blu-ray extras include deleted scenes, a blooper reel and two making-of featurettes. Remakes have become so commonplace in Hollywood that even mediocre movies are often reborn. Witness “Footloose,” a modern adaptation of Kevin Bacon’s 1984 ode to youthful rebellion. The original movie has retro charm, thanks largely to Bacon’s star power, but there was no need to resurrect it. That makes it a credit to director Craig Brewer (“Hustle & Flow,” “Black Snake Moan”) that things turned out as well as they did. Kenny Wormald takes over for Bacon, playing Ren MacCormack, a Boston boy who moves to Bomont, Georgia, to live with his aunt and uncle. Still reeling from the death of his mother, Ren finds it difficult to fit into this small community, especially since the city council has banned unsupervised dancing by area youth. The main proponent of the no-dancing law is Reverend Shaw Moore (Dennis Quaid), a man devastated by the fact that his teen son died in an auto accident after a night of partying. As in the original movie, Ren quickly finds himself flirting with Reverend Moore’s daughter, a saucy rebel named Ariel (Julianne Hough). Frustrated by her father’s iron-fisted policies, Ariel acts out at every opportunity, and cozying up to a militant city boy seems like a perfect move. Brewer allows the action to play out very much as it did in the original film, and the result is surprisingly fun. Wormald is solid as Ren, and he makes the character easy to root for. Hough gives Ariel depth so that viewers not only like her, but understand her. And, although this is a teen movie, the older actors (Quaid being the best known) pull their weight. There’s nothing fresh about “Footloose,” but this is as good a remake as anyone could hope for. Film lovers who’ve had their fill of romantic comedies that telegraph their endings as soon as they begin, will do well to dip into “Like Crazy,” an inventive drama that takes a realistic approach to love and courtship. Co-writer and director Drake Doremus (“Spooner”) focuses on Jacob (Anton Yelchin) and Anna (Felicity Jones), a pair of twenty-somethings who fall in love while attending college in Southern California. Their romance seems destined to last, as long as it can overcome one major hurdle: she is British and he’s American. That may seem a minor issue in by 21st century standards, but Anna complicates things by overstaying her visa (to spend more time with Jacob, of course) and getting banned from the U.S. In the typical Hollywood romance, Jacob would leave everything, including his budding furniture business, to follow Anna to London. But Doremus isn’t keen on tidy storytelling. Instead, he allows viewers to watch as Jacob and Anna try to make a go of it long distance, frequently failing. “Like Crazy” may not present the most romantic vision of young love, but it’s certainly realistic. Yelchin and Jones have excellent chemistry, both with each other and a talented group of co-stars that includes Jennifer Lawrence, Charlie Bewley, Alex Kingston and Oliver Muirhead. As good as “Like Crazy” is, it comes with frustrations, many of them stemming from the fact that Doremus does a dreadful job denoting the passage of time. One moment Jacob and Anna are in each other’s arms; the next they are separated and pursuing new interests. There’s a lot to like about the messiness of their romance, but it would be better if we knew just how much time passed between one scene and the next. DVD and Blu-ray extras include an audio commentary by Doremus, editor Jonathan Alberts and cinematographer John Guleserian. “Game of Thrones” – The Complete First Season: First 10 episodes of the HBO fantasy series based on George R.R. Martin’s “A Song of Ice and Fire” books. The plotting follows the families of the Seven Kingdoms of Westeros as they battle each other for power. This collection is available on both DVD and Blu-ray, and each release features many extras, including a 30-minute making-of feature, character profiles, and seven audio commentaries with the cast and crew. “The Skin I Live In”: Golden Globe-nominated Spanish thriller about a plastic surgeon (Antonio Banderas) who, haunted by his wife’s death, is trying to create synthetic skin that cannot be damaged. Elena Anaya, Marisa Paredes, Jan Cornet and Roberto Alamo also star. Co-written and directed by Pedro Almodovar. Presented in Spanish with English subtitles. “Columbus Circle”: Thriller about an agoraphobic heiress (Selma Blair) who is forced to confront her fears when the death of her elderly neighbor brings a homicide investigation. Giovanni Ribisi, Amy Smart, Beau Bridges and Jason Lee also star. Co-written and directed by George Gallo. “Blade of Kings”: Martial arts film about a boy who must complete an epic journey in order to become ruler of his land. Jaycee Chan (son of Jackie Chan), Donnie Yen, Gillian Chung and Charlene Choi star. Also, Jackie Chan makes a special guest appearance. Presented in Cantonese with English subtitles. “Happily Divorced” – Season One: First 10 episodes of the TV Land sitcom about a Los Angeles woman (Fran Drescher) whose long-time husband (John Michael Higgins) announces that he’s gay. Nevertheless, they continue to live under the same roof, doing their best to adjust to their new roles, as well as single life. “Barbie in A Mermaid Tale 2”: Feature-length animated movie in which Barbie reprises the role of Merliah, a magical mermaid princess. The DVD includes outtakes, trailers and a music video. “Adventure Time – It Came from the Nightosphere”: Sixteen episodes of the Cartoon Network series about a human boy and magic dog living in a strange and exciting land. “Transformers – Prime” – Season One: Boxed set collecting episodes of the newest animated series to star the Transformers. As with previous entries to the franchise, the series is built around battles between the evil Decepticons and friendly Autobots. The DVD and Blu-ray releases come packed with extras, including a making-of special and 15 audio commentaries by the creative team. “To Catch a Thief”: Blu-ray debut of Alfred Hitchcock’s 1955 classic about a retired jewel thief (Cary Grant) living in the French Riviera. When a new series of robberies begins, he tries to find the guilty party in order to prevent authorities from blaming him. Grace Kelly also stars. Lionsgate Blu-ray debuts: Lionsgate is rolling “Reindeer Games: The Director’s Cut” and “54” onto Blu-ray for the first time. “Reindeer Games” stars Ben Affleck as an ex-convict who finds himself in hot water when he’s coerced into a dangerous robbery plot. “54” is a fictionalized look at Studio 54, a famous 1970s disco in New York City. “Tooth Fairy 2”: Direct-to-video sequel to the original theatrical release. This time around, it’s Larry the Cable Guy who gets a shot at winning children’s hearts by leaving them money for the baby teeth they shed. “Lion King 1½” and “Lion King 2 – Simba’s Pride”: Disney is releasing new Blu-ray combo packs of both direct-to-video sequels to “The Lion King.” Neither movie has the sparkle of the original, but they have staying power with kids. You may be right that it’s better to remake a fluffy movie than a great one. There’s certainly less pressure on the filmmakers. Plus, there’s always the possibility that you can make a better film than the original. I don’t envy you on weeks like this. I enjoyed Footloose although it was more intense than I remember the original. Still, loved the dancing! I think it is almost better to remake a fluff piece that people feel nostalgia for than a truly great movie. However, it is one more example that most of Hollywood is out of ideas.